Dr. Samuel M. Young, Jr. is an Independent Max Planck Research Group Leader of Molecular Mechanisms of Synaptic Function at the Max Planck Florida Institute for Neuroscience in Jupiter, Florida. He received his PhD in Genetics and Molecular Biology at University of North Carolina-Chapel Hill. He went on to conduct post-doctoral research in the Molecular Neurobiology Laboratories at the Salk Institute in La Jolla, California and at the Max Planck Institute for Biophysical Chemistry in the Department of Membrane Biophysics in Goettingen, Germany, where he later accepted a position as an Internal Research Group Leader. Samuel then accepted a position at the Max Planck Florida Institute where he is currently. Samuel is here with us today to tell us all about his journey through life and science. When he’s not at work, Sam likes to hang out and go fishing with his two kids. One of his favorite activities these days is long-distance cycling because it is a great way to stay active, and it gives him a chance to relax and think. Sam spends his time in the lab meeting with students, working on data analyses, reading literature, planning experiments, and trouble-shooting problems. His research focuses on the cellular and molecular mechanisms that allow synapses to sustain information transfer to enable hearing. Curiosity attracted Sam to science, even as a kid. He grew up in a small town in North Jersey and spent a lot of time reading science and science fiction books. Sam made it through childhood intact, despite a short phase where he was fascinated with building things that would explode. He remembers having excellent middle school science teachers who really nurtured his interest in science. Overall, graduate school went really well for him, but he got to the point where he just needed one last experiment for a manuscript he was writing. Sam took a methodological short-cut in the experiment that resulted in him getting kicked out of his graduate school lab. His advisor felt like Sam wasn’t happy and wasn’t doing science for the right reasons. After a period of soul-searching Sam returned to science and hasn’t looked back since. Sam and his postdoc are working on a project in the lab now where they have discovered a class of molecules that control the availability and release probability of synaptic vesicles (storage containers for neurotransmitters) in neurons. This exciting finding has opened up a lot of possibilities for interesting experiments and questions in his lab. One of Sam’s favorite travel experiences was a trip to Budapest, Hungary. He went to a conference there and stayed at the Hotel Gellert on Buda Hill with a great view overlooking the river. They enjoyed the sights and the spectacular Turkish baths. 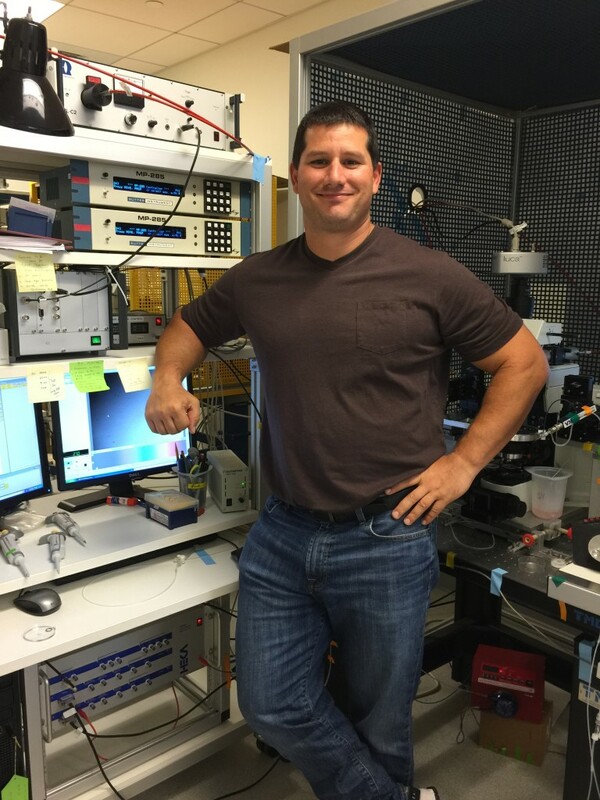 Relatively recently Sam was sorting out data issues with some lab members, and he was getting frustrated, so he started quoting Rick Flair (renown professional wrestler). He quickly realized that no one knew who Rick Flair was, so he made the group watch Rick Flair videos multiple times until the messages sank in. Sam is also known to use videos of the Rocky training scenes and threats to play heavy metal music to inspire productivity in his lab group. Never give up. If you put your mind to it, you can do anything you want in this world. Don’t let anyone tell you you can’t. The long term goal of Sam’s lab is to understand the mechanisms of synaptic vesicle release and recovery that permit the accurate encoding of sound over wide dynamic ranges over varying times scales. The calyx of Held/MNTB synapse in the auditory brainstem is a key connection in this pathway since it provides precise timing and activates sustained inhibition to key binaural cell groups. Its large size has made it an experimentally accessible entry point into understanding the mechanisms and function of these synaptic connections. The calyx can be driven by sound at high rates, operates in the background of varying spontaneous firing rates, and yet must be relatively immune to acoustically noisy backgrounds. How is this achieved? Since the presynapse has a finite supply of fusion competent synaptic vesicles (SVs), termed the readily releasable pool (RRP), the release and replenishment of the RRP must be balanced to sustain transmission. Priming, the creation of fusion competent SVs at the active zone (AZ) that can be released in response to action potentials (APs), is a key regulatory pathway that regulates the RRP release and replenishment to sustain transmitter release. Ultimately, the molecular mechanisms that regulate priming underlie efficient release and replenishment of SVs underpins sound encoding. Therefore Sam’s group aims to define the molecular mechanisms that ensure availability of release competent SVs throughout a wide range of AP firing rates to support the early stages of auditory processing. As release and replenishment of the RRP is necessary in all synapses to encode information over varying timescales, their data will have broad relevance to understanding how synaptic communication leads to information transfer in neural networks.